Directions: Use after brushing the teeth with toothpaste. 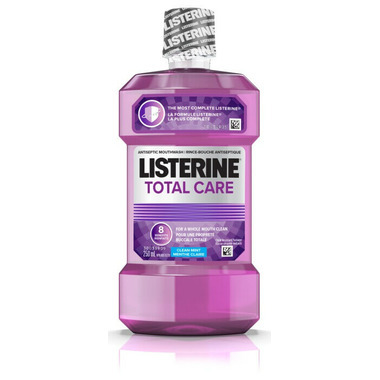 Adults and children 12 years and older: Rinse full strength with 20 mL for 30 seconds twice a day. DO NOT SWALLOW. Do not eat or drink for 30 minutes after use. Active Ingredients: Eucalyptol 0.091%, Thymol 0.063%, Menthol 0.05%, Sodium Fluoride/Fluorure de sodium 0.05%, Zinc Chloride/Chlorure de zinc 0.09 %. Non-Active Ingredients (alphabetically) : Alcohol, Aroma (Flavour), Benzoic Acid, Blue 1, Methyl Salicylate, Poloxamer 407, Red 40, Sodium Benzoate, Sodium Saccharin, Sorbitol, Sucralose, Water (eau). Caution: Do not use if allergic to any ingredients. Stop use and ask dentist if oral irritation or any new symptoms occur. Keep out of reach of children. Not to be used by children under 12 years of age. In case of accidental ingestion, contact a Poison Control Centre or doctor immediately. SECURITY FEATURE: Do not use if security band around cap is missing or broken. Note: Store between 15-30°C. Cold temperatures may cloud this product. Its efficacy will not be affected.